Spicy Chicken Stew: You braise some chicken with tasty stuff. Scoop it ’til the last drop. Feel better. Sleep better. Especially in a chilly winter day. You know the deal. Soothing and hearty taste of chicken will allow you to enjoy the rich flavour of Korean style stew with peeled chunks of potato and carrot. It’s earthy and inviting, but it’s not knock-your-socks-off spicy, as its deep red colour might suggest. Now that it’s been chilly pretty consistently, it’s time to cozy up and enjoy thishomestyle Korean menu: you’ll feel better instantly. A spicy comfort in a cold weather, enjoy the aroma and the flavour of this spicy Korean chicken stew made with Korean chili paste! This stew is to die for. Now, you can visit SURA Korean BBQ Restaurant for this great deliciousness! 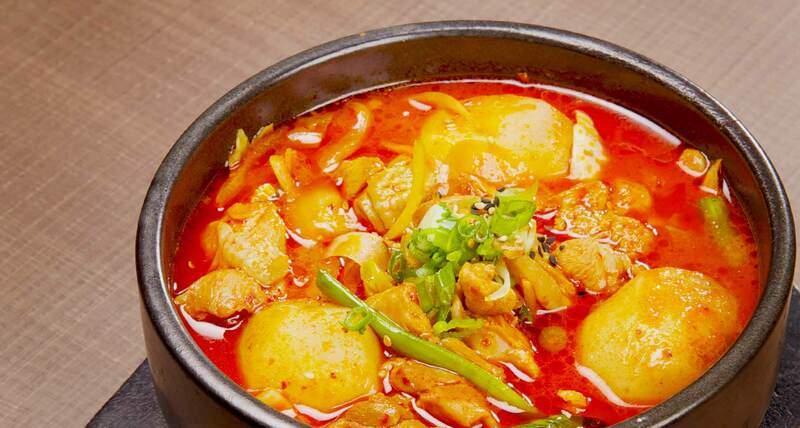 Click HERE to view SURA Spicy Chicken Stew on our awesome menu!